In a large pot, bring your water and honey to a boil, stirring occasionally. Once it reaches a boil, turn the heat off, add your lavender, and let it cool. While your honey lavender water is cooling, squeeze your fresh lemon juice in a measuring cup. It will take about 8 to 10 lemons to get to a full cup of juice. Once your honey lavender water has cooled, pour in your lemon juice, and stir it around. Taste your lemonade and adjust as needed by adding more water if the lemon flavor is too strong and more sweetener if it is too tart. Now, you can strain your lemonade to get the lavender pieces out, or leave them in your pitcher or serving container for aesthetic. I like the way it looks in our big glass mason jar dispenser with the lavender floating around. I even added some extra lemon rounds. It doesn't make its way into the glasses and is just for looks. If I were just going to make this and drink it myself, I'd probably just strain the lavender out with a mesh strainer. 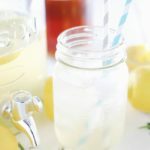 Add ice and serve your honey lavender lemonade!